Warning: this is rambling, a bit introspective, and entirely related to my experience of sounds in Seoul (If you want to read some points about concerts, albums and music stores, just scroll down to where it says Let’s talk about music). How can NELL’s CDs be so pretty? It took an unacceptable amount of time to rephrase the title for this post, so I hope you appreciate it in all its glorious simplicity and soul/seoul-iness. I am sitting here with three brand new albums (well, I was when I wrote this on October 16th) and feeling moderately victorious over surviving three of my four classes’ finals (let’s not talk about how they went, just acknowledge the fact that they’re over). I have multiple Korean exams and tests left of course, but I’ve studied enough today and I need to catch up on some blog posts! Music is life for me. I listen to music almost constantly, although I have a deep appreciation for silence – both the kind where I am silent and I listen to the noises that the world around me creates, and the kind where everything is so silent that you can hear your own heartbeat pushing blood through your head. Silence is a beautiful thing, and in Seoul, it is rarely so silent that the latter is possible. The former, however, is a glorious thing to experience. I love sitting outside at night as the weather gets colder and listening to the wind twist through the trees and sends leaves scattering across the pavement for adorable ahjussis to sweep up in the morning. The night is crisp and alive in its own beautiful way. I don’t sit in the bustling downtown – no, I mean sitting outside near trees and buildings where people are sleeping or simply not there. To me, that kind of silence is music too. It’s as much of the sound of Seoul as the K-pop and K-drama ballads blaring from beauty stores and the street musicians busking from benches and stages. It’s as important as the little welcoming song played as the subway trains enter and exit their stations, and the sound of the rumbling of countless people riding Line 2 home. The sounds of old men chatting, friends laughing, and couples being….couple-y. The words of friendly cafe baristas pretending they aren’t laughing at your worried face as you ask what you think means, “What time do you close your doors for the night?” These are the sounds of life here. Seoul sounds include the silence and the loudness alike, and every noise in between. Before it got dark and the party really got started at Brave. 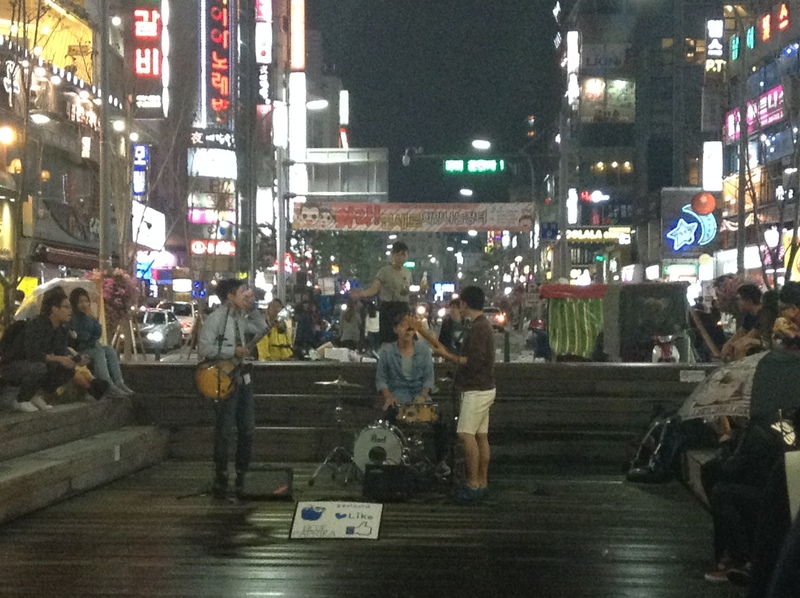 Being in Seoul has been incredible even though I’ve barely taken advantage of the music scene. I’ve been to two concerts, sure. 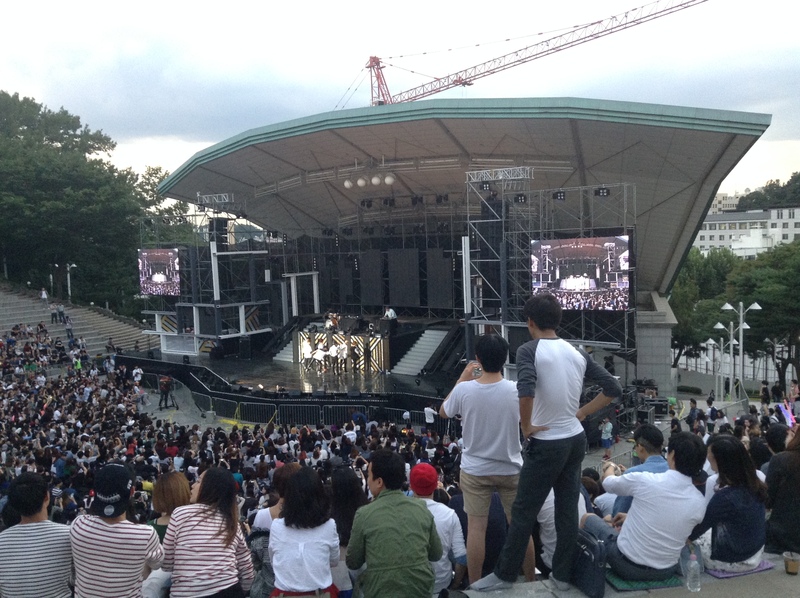 One was the Brave Concert hosted at Yonsei University each year – 30,000 won and I got to see a plethora of artists I enjoy and a few that I love (did someone say San-E, Jay Park, BTS, and Dynamic Duo? Mmm yes please. I didn’t know until that day that I’ve been living the last few years of my life for the sake of singing 불행했음 좋겠다 with San-E and 좋아 with Jay Park live…. )…and a couple I’d never listened to in my life. The other was the free SKY Festival in Incheon. Both were definitely worthwhile to go to, but to me, I love street music just as much as official concerts. In fact, I sometimes love it more. Did I spend two hours listening to this church choir amaze my ears? Yes. So incredibly worth it. Also, that man in the tan sweater looked exactly like Choi Jin-hyuk. Sinchon has a fairly good street music scene, and it even hosts fan signings and meets (all of which I’ve been very sore to find out about AFTER the fact that BTS and Roy Kim have both been within a mile of me…and Taeyang was just in Hongdae doing a fansign at an Olive Young). 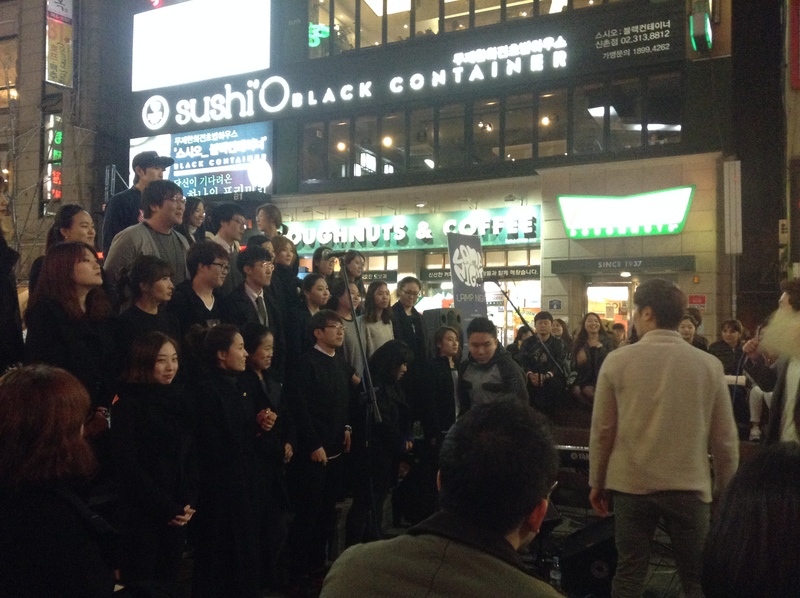 I’ve been more impressed with Hongdae, although the crowds there are usually so dense that it can be difficult to get close enough to even see the performer(s). My frustration has been that most of the time, the people I’m with say that “Oh I like street music!” then 30 seconds into a song, they grow impatient and the group leaves. After a month and a half, I decided to just let them leave and stay by myself and enjoy it 혼자 스타일, but it became pointless at that point in time because I haven’t been anywhere that has street music with those friends since. I’m rambling a lot in this post, but I have a lot I’m thinking about and I’m tired of writing structured research papers on the security dilemma and inter-Korean political dynamics….. I actually had a bad experience the first time I heard street music with friends who actually mean it when they say they like street music – not because of those friends, though. I might cover it in another blog post, but essentially, drunk ahjumma = stay far away, don’t attempt to be polite (I mean, do, but don’t expect it to be effective. Just leave, just go. Don’t waste your time trying to put up with it). My advice is that, if you’re listening to street music and someone who makes you uncomfortable approaches you, pretend you don’t speak either Korean OR English. Give them that 멍 face. While leaving. Actively leave that situation. My mistake was that she heard me speaking English to my friends and I replied to her in Korean, and so she knew I could understand her in both Korean and English when she started drunkenly cussing at me in both languages. She’s that outline standing in the background behind the drummer, not yet drunk enough to attack foreigners. Anyways, it was a good time (the sarcasm is strong with this one). It’s the greatest thing of all time. I bought three new albums today: NELL’s Newton’s Apple, Park Hyo-shin’s Gift: Part II, and Roy Kim’s Home. I tried to buy tickets on Interpark this past week. Interpark is an evil, evil site, and it comes in varying levels of evil and in different languages with different concerts (un)available depending on the language you use. There are some Korean concerts for which foreigners cannot buy tickets. I’m not really sobbing that hard internally when I say Standing Egg, AKMU and Epik High concert tickets were unavailable for purchase and I wasted several hours of study time attempting to buy them before it became clear that foreigners cannot purchase them. And Epik High is going to perform on my birthday….no, I’m not bitter at all…. Park Hyo-shin’s concert, which was my number one wish when I came here in terms of concerts I want to attend, was sold out before I could get to a computer where Interpark wouldn’t crash. Here’s to hoping some poor soul cancels their tickets (and let’s me buy VVIP section wahhhh). Not going to happen. That man’s voice is unreal in the very bestest of ways. Old songs and new songs alike, how is he so good. Here’s the single he came out with this past year. 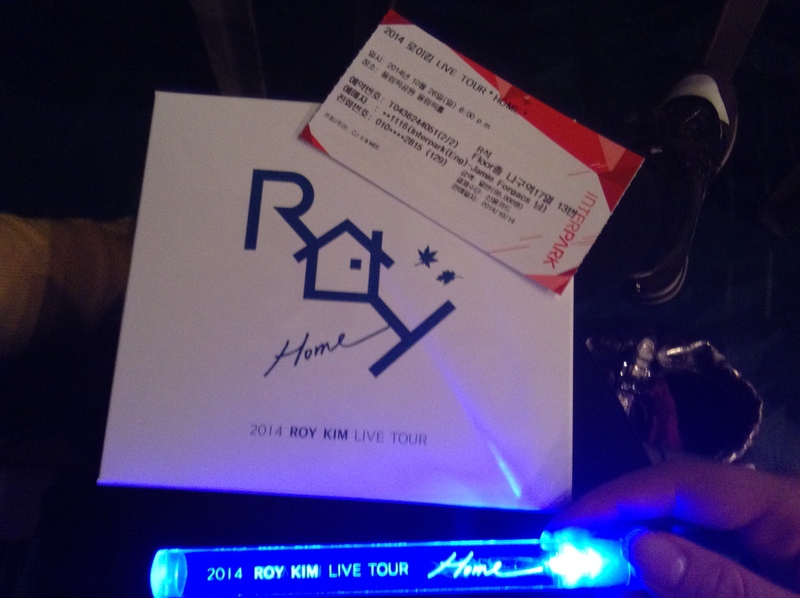 But I DID manage to buy Roy Kim tickets! Life 성공. He just came out with an album (the one I bought today) and I can’t stop listening to it. (How is that man only one year older than me? He makes music; I need to get on this whole becoming a published fiction author business….) But you know what makes it even better? I didn’t know he had a concert in Seoul – I half-considered a brief dash down to Busan or Daegu where I knew he had a tour. I found the Seoul one by accident while being thoroughly upset about Park Hyo-shin’s absence from my December. And you know what else? 정성하, who features in his song Curtain (if you know Sungha’s music, you would’ve known it was his guitar-playing the moment you heard that song 🙂 ), will be performing alongside him at the Seoul concert I bought tickets to. Yeah. Yeaaaah. I’ve seen Sungha Jung perform in my home state of dear old Michigan and I even met him, got his autograph on his CD and my concert ticket, and got to take pictures with him. So talented. Also adorable. Also much taller than I am. All good things. Many 누나 feels. As the concert happened subsequently to writing this post, here’s ticket, bandannas (the box holding them, that is), and light stick. No pictures allowed AT ALL during most concerts in Korea, so this is before the concert began. Did Roy Kim waltz by two feet away from me while singing L-O-V-E? Yes. Am I somehow still alive? Yes. Incredibly enough, yes. If you walk from the main gate of Yonsei towards UPLEX, Hyang Music will be tucked away on the right side of the main street. Width wise, it’s probably only about ten feet, so it’s very easy to miss. Sometimes you can get free posters if a music store receives too many. Like today, when the lady practically begged us to take Vixx posters. I won’t say no! One for me, one for my friend. They’re 2 by 3 foot. I think I’ll be able to wallpaper my room when I go home. I apologize for the amount of rambling in this post, but I hope it was at least mildly interesting. As always, thanks for reading. Until next post! That nell cd is gorgeous !! Isn’t it? 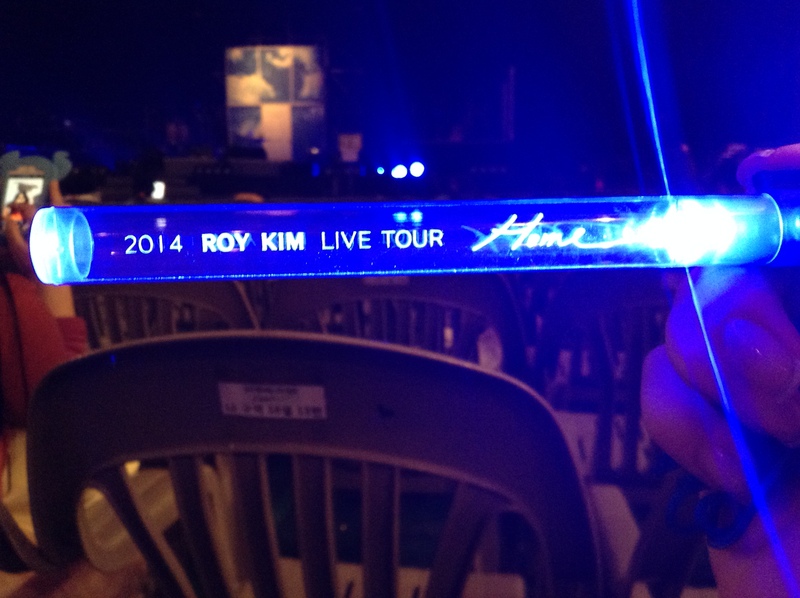 !^^ I love their album designs….